Mexican food is awesome. Fresh Mexican food is even better. 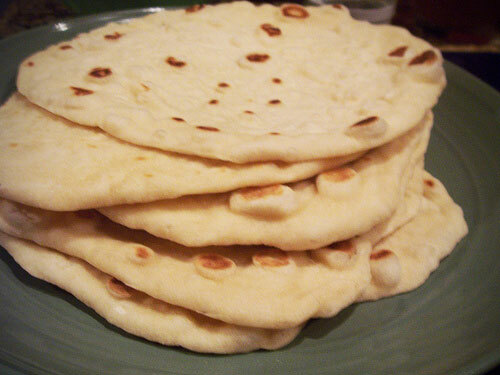 If you want to eat awesome, fresh Mexican food you’ll need to learn how to make your own tortillas. It’s a skill I have yet to pick up, but hope to soon. As a bonus, you avoid all of the weird stuff that might be lurking in commercial flour tortillas (including Chipotle’s flour tortillas). After searching around a bit, here’s the approach I plan to take (originally posted at The Fresh Loaf). If you’re not vegetarian or vegan, the lard version will product better results. If you’d prefer corn tortillas, you can also go that route (and corn tortillas are pretty damn good too). Combine the dry ingredients in a bowl. If possible, transfer to a mixer. Add the lard and mix until well-combined and the mixture looks grainy. Add the warm milk and mix until a smooth ball of dough forms (about five minutes). Divide the dough roughly into 12 equal balls. Roll the balls into 6-7″ tortillas. Cook on a griddle over medium heat until golden brown and puffy.